Leighton Buzzard were left stunned on Saturday as they lost 27-22 at home to lowly Melton Mowbray, dragging them to within five points of the relegation zone. For the first time this season, Buzzards came away from the game having lost to opposition lower than them in the table, and though they remain ninth in Midlands 1 East heading into the Easter break. And with only three games to go, Leighton are by no means safe from dropping out of the league, and take on fellow strugglers Northampton Old Scouts next, who sit a place and a point below Buzzard. Whilst Leighton played well at times against Melton Mowbray at Wrights Meadow, notably at the start and for a spell in the second half, too many mistakes and, at times, poor game management contributed to the defeat. Leighton missed the opportunity to go ahead after three minutes when a penalty attempt hit a post. But five minutes later, they would take the lead, courtesy of Wills Messum as the forwards got moving after a line-out. Slowly Melton Mowbray established more territory and possession and pulled the score back to 5-3 with a penalty after 23 minutes. Five minutes later a missed tackle and a clean break in the centre allowed the visitors to score their first try and, with the conversion, make the score 10-5. Buzzards replied with a Darren Braybrook penalty and whilst they finished the half threatening the Melton Mowbray line, they could not add further points to leave the half-time score 10-8. The first 15 minutes of the second half were a disaster for the Buzzards - firstly the Melton Mowbray number 12 jinked through for his second converted try for 18-7. Buzzards responded with one of their best attacking moves – but in one of the games crucial moments the ball was dropped just short of the line. 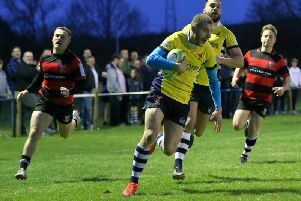 The visitors’ fly-half, who had an excellent game, recovered the ball and ran to the Buzzard twenty-two where he passed for the winger to score in the corner. With the conversion missed Melton Mowbray had a fourteen point lead at 22-8. Leighton were now trying to play catch-up and mistakes were being made. And it contributed to Melton Mowbray scoring their fourth try after 15 minutes but there was more than a hint of obstruction as Buzzards last defender was blocked. Again the conversion was missed to make the score 27-8. Suddenly Buzzards found an additional gear and upped the tempo – an excellent break by Jack Whitehouse and good support led to Ben Beaumont scoring under the posts after eighteen minutes. Darren Braybrook converted for 27-15. Five minutes later as pressure grew, Braybrook scored and converted his own try to bring Buzzards within five points at 27-22. Despite increasingly fraught attempts to add to their score, the Buzzards could not find a way through and for much of the final minutes were frustrated by the visitors pack who controlled possession for significant periods. Leighton had to settle for a losing bonus point and can take encouragement from a committed debut from new second row Dami Adebayo.